Handmade and more natural products are better for you and our environment. We make soap the old fashioned way. Using oils, butters and waxes from renewable vegetable sources that are known for their skin benefits, we use the cold and hot process of soap making to create a sudsy soap that lathers thick and rich. Using oils like olive and soy which both add to the skin benefits and the bar benefits of Soap for your Soul. 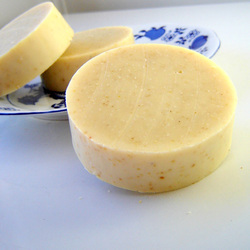 Palm oil is a vegan alternative to the traditional tallow or lard, and makes a nice, hard, long-lasting bar of soap. One of the most important oils we use is coconut. It gives our soaps that thick rich lather with beautiful fluffy suds. We only use essential oils or phthalate-free fragrance oils for scent. These are noted in each soap's description, and comprise less than 1% of our recipes. We make soap that's healthy.